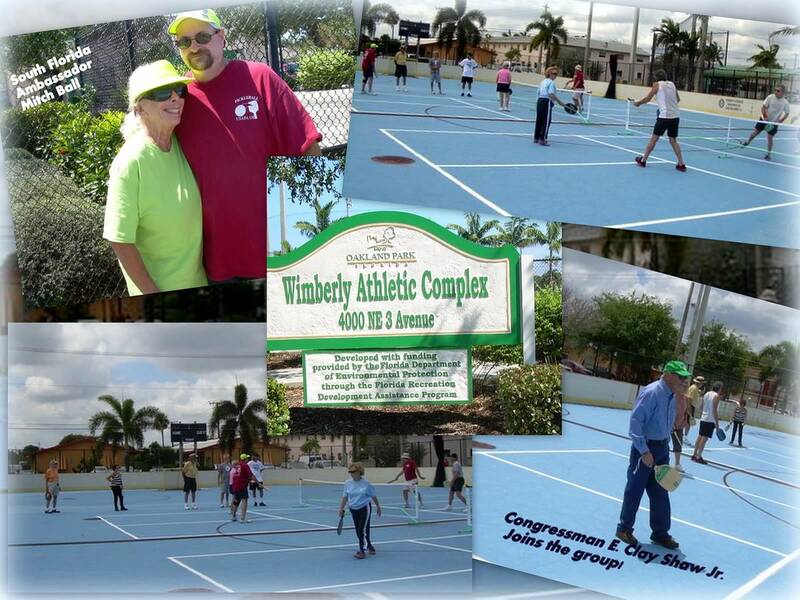 On Saturday, April 6th, FIFTY-FIVE people showed up at the Wimberly Athletics Complex in Oakland Park, FL where South Florida ambassador Mitch Ball was hosting a pickleball demo/clinic. Permanent lines have been painted converting the Hockey Rink at this Oakland Park to two pickleball courts. Also joining the group today to support the introduction of pickleball to Oakland park was former Congressman E. Clay Shaw. Both he and his wife took to the courts! help to make this a huge success," says Mitch. Joel Schaumberg is a Florida snowbird who plays and teaches pickleball regularly in Michigan. He came to help with the event and had the following to say: Great event, huge turn out, lost of new folks. Thank you, Mitchell. You hosted a wonderful event, and you do an amazing job representing pickleball . Another pickleball demo/clinic is scheduled at Pine Island Park on April 25th, followed by Open Play. And the Town of Davie 1st Pickleball Tournament will take place on May 11, 2013, More information on these events and pickleball in South Florida Pickleball site. CLICK HERE for more pictures of the Oakland Park demo/clinic.